The names on the railroad cars in the foreground represent many different lines, and sheds can be seen behind them between the tracks and the factories. At the left is the John D. Raab Chair Co., just above it is the Herkimer Hotel that was located on the corner of South Division and Wealthy St., at the far right--where the smokestack is spewing black smoke--is the Furniture City Brewing Co., and the building between the Brewing Co. and the Raab Co. appears to be the Globe Knitting factory. Barely visible on the horizon and just to the right of the Herkimer Hotel one of the tower lights, used to light the city at night, can be seen. 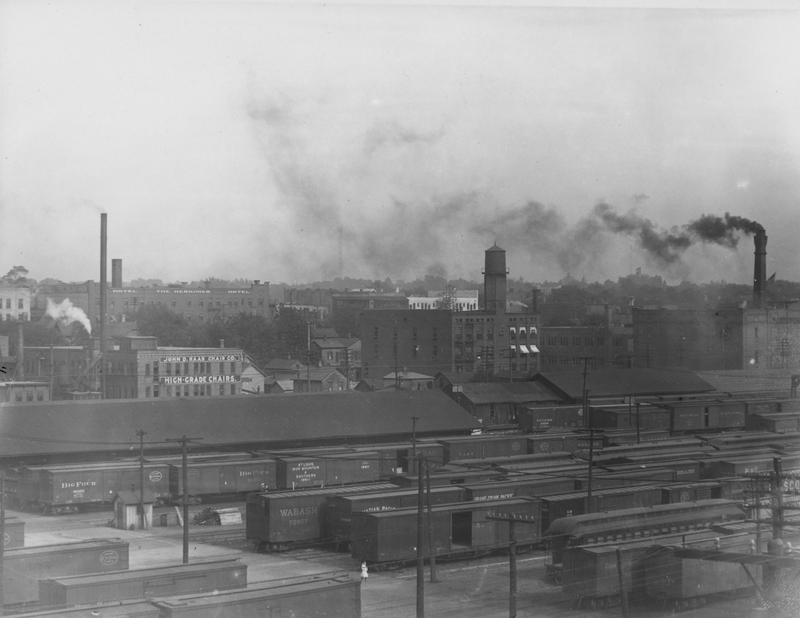 At the bottom center of the photo a little girl in a white dress passes through the train yard, possibly on her way home from the South Division St. School. Photograph, 8 X 10 in.